There are two methods to identify the integrated graphics controller (hardware) in your computer. Integrated graphics controllers are also called video cards or graphics cards. Check the following link to identify the Intel® Graphics Driver Version installed on your computer. 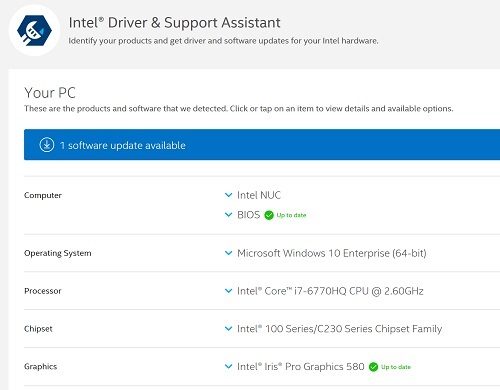 The Intel® Driver & Support Assistant helps you identify the Intel® Graphics Controller on your computer. It can also identify if a driver update is required. If you see the adapter listed as Microsoft Basic Display Adapter or Standard VGA adapter, then Windows is working with pre-loaded generic and basic video drivers. Check with your computer manufacturer to determine the graphics controller your computer uses so the proper driver can be installed. If you see the adapter listed only as Intel® HD Graphics without any numerical identifier, or if you cannot identify your adapter using either of the methods detailed here, refer to How to Identify My Intel® Processor and, once you've identified your processor, visit our Product Specification Page (ARK) to manually search for your processor and verify its specifications. Manually identify your Intel® Graphics Controller. Select your operating system from the list below and follow the instructions. Right-click anywhere on the desktop and choose Display Settings. See the graphics controller identifier displayed in the Adapter Type section of the Adapter tab. If you see the adapter listed as Microsoft Basic Display Adapter or Standard VGA adapter, then it means that Windows is working with the pre-loaded generic and basic video drivers. Check directly with your computer manufacturer to determine the graphics controller your computer uses so the proper driver can be installed. If you see the adapter listed only as Intel® HD Graphics without any numerical identifier, refer to How to Identify My Intel® Processor and once you have identified your processor visit our Product Specification Page (ARK) to manually search for your processor and verify its specifications. If you aren't in desktop mode, select the Desktop tile. Right-click anywhere on the desktop and choose Screen resolution. If you see the adapter listed as Microsoft Basic Display Adapter or Standard VGA adapter, then it means that Windows is working with the pre-loaded generic and basic video drivers. Check directly with your computer manufacturer to determine what graphics controller your computer uses so the proper driver can be installed. This article applies to 77 products.